I'm a week late on posting our letter N activities and that's because, well, N week wasn't all that fun. The tot trays were a total bust and we were still trying to get resituated in our house so Ethan's mind was elsewhere (playing with the toys he'd been away from, reading the books he hadn't seen in weeks, etc.) and each day was a little more chaotic than usual. 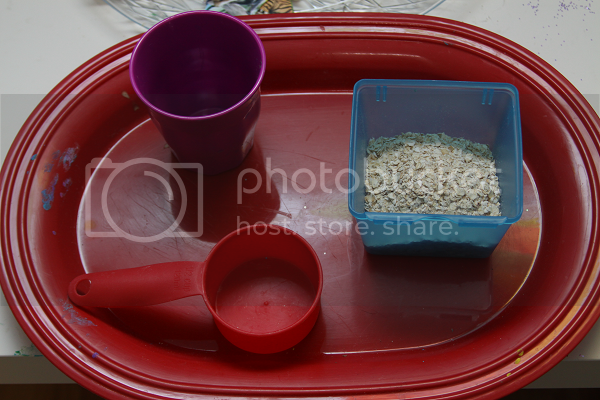 This tray was probably the most popular one. 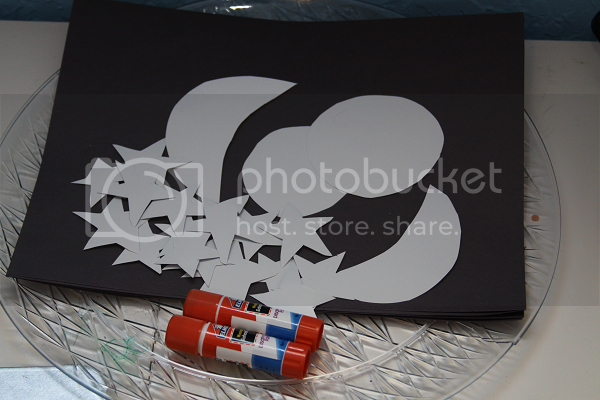 Ethan loves gluing so I cut out some moons and stars and let Ethan create his own nighttime sky using glue. 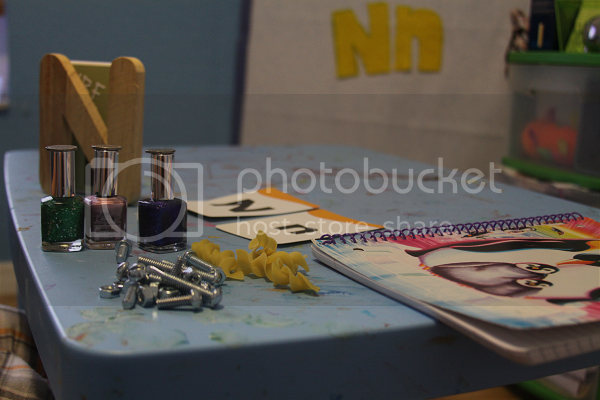 The letter N discovery bin was filled with nuts & bolts, a notebook, nail polish, noodles, a wooden letter N and some flashcards. 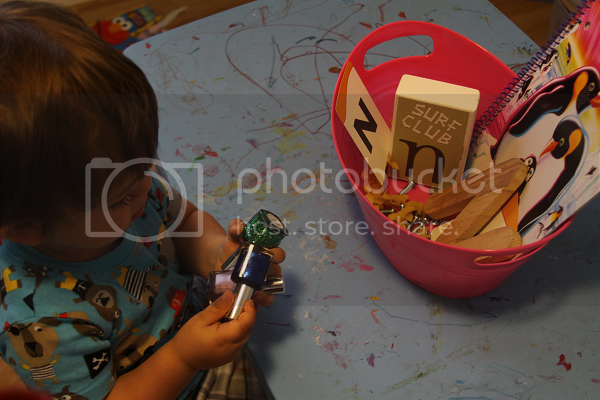 Ethan enjoyed the nailpolishes the most and was sporting some way cool green toenails by the end of N week. I was sure he'd like the nuts and bolts more than he did but he ended up having virtually no interest in them. He did love writing "notes" in his notebook throughout the week! 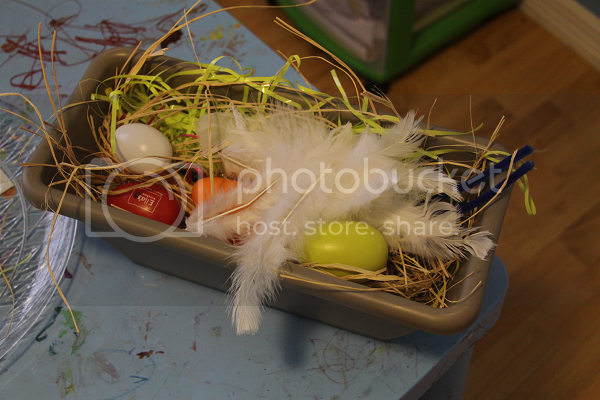 I set Ethan up a bin with some raffia, feathers, yarn, pipe cleaners and some artificial eggs (all but one were music shakers -- the other one came from his play kitchen!). 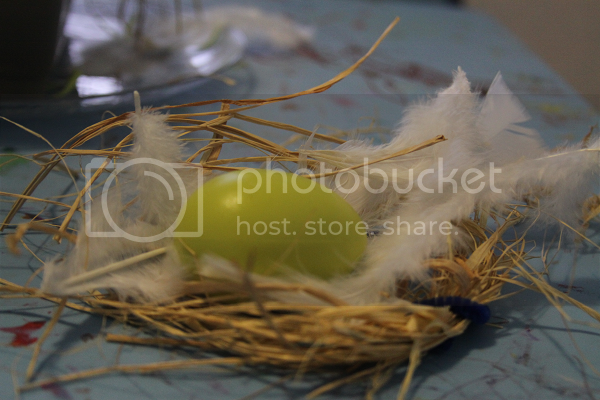 Ethan's job was to build a nest. A couple of times he was really into this activity but towards the end of the week he lost interest in it rather quickly. The tracing activities have become Ethan's favorite. He expects them every week at this point and is surprising me with how well he can begin tracing the letters! 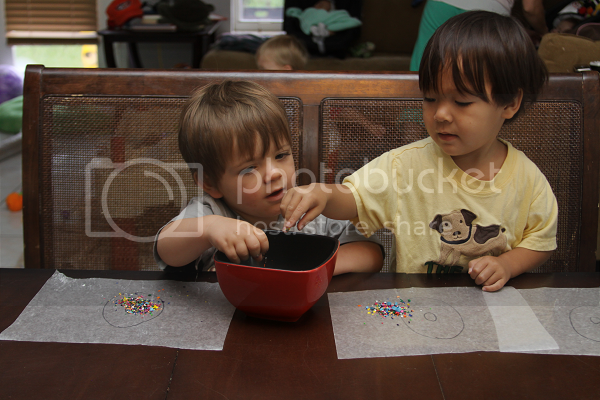 For as long as he's interested, I'm going to keep the tracing activities coming. Can we talk about how sad I am that Ethan was just "meh" at this tray? 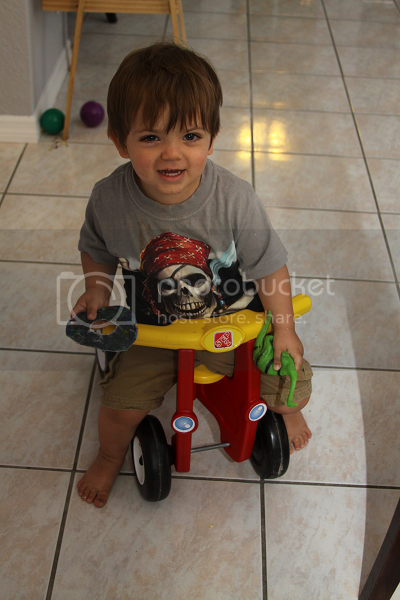 I was sure it would be his favorite and I was so excited for him to use it but, you know, that's how toddlers are. He's really into number recognition these days but I think it was the buttons that turned him off of this one. 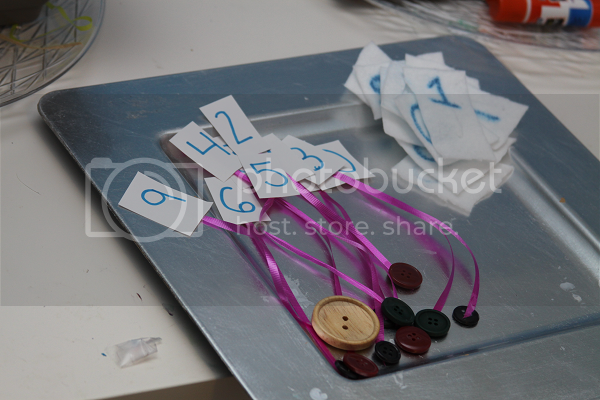 I had written some numbers on card stock and attached a string with a button to each one. 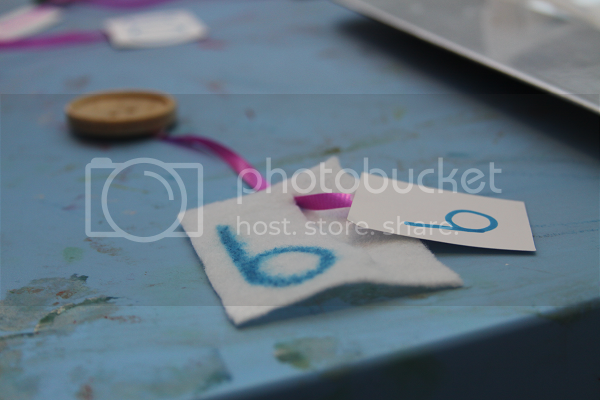 On white felt, I wrote another set of numbers with a slit in them. Ethan's job was to match the numbers by buttoning them on. 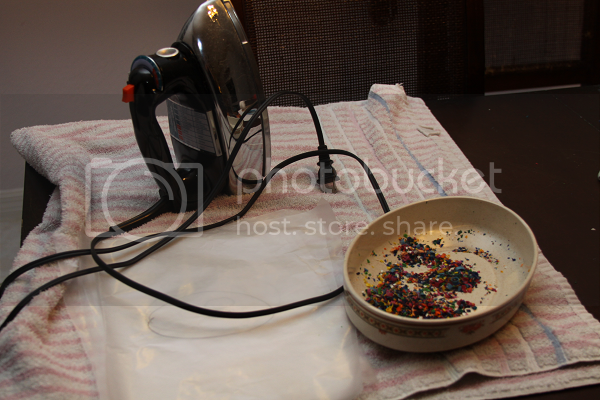 This was a fun transferring activity. 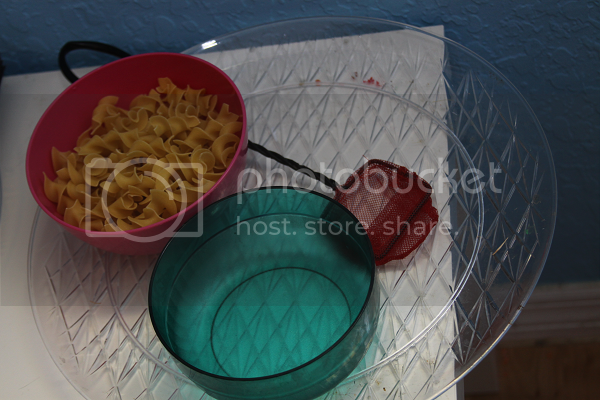 Ethan got to use a net to transfer the noodles from bowl to bowl. 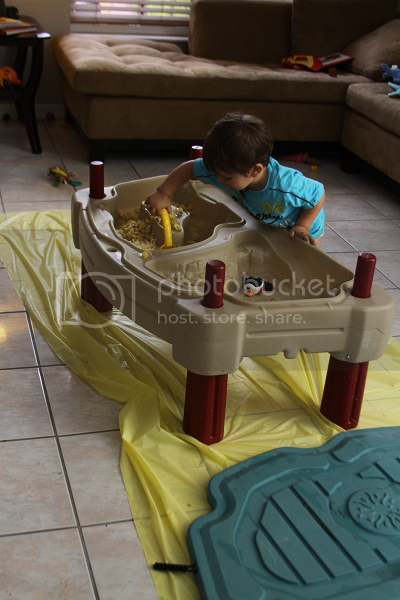 Speaking of noodles, I also filled the water table with boiled noodles and let Ethan go nuts in the living room. O week went MUCH better than N week. 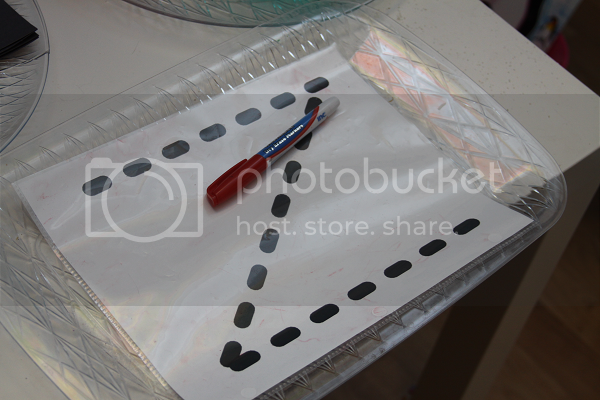 The trays were much more popular and then, the most exciting part, is that we now are part of a weekly Tot School group! 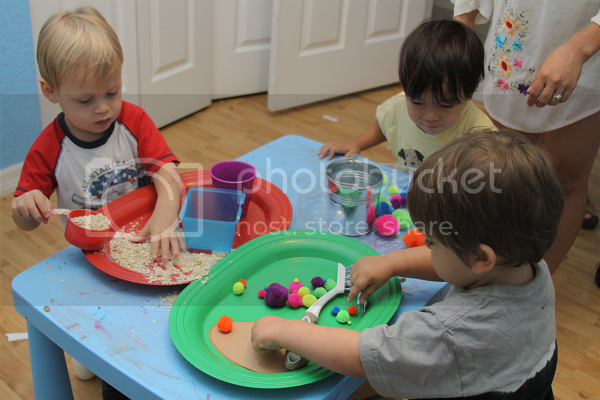 Each week, Ethan has two friends come over (the three boys are almost exactly the same age to the week, which was cool) and they each work on their own tot trays, do a craft and have lunch. O week was our first week as our little group and so there were some hiccups, but I think it's one of those things that will work itself out in time. Eventually everyone will get the hang of the group setting. Ethan was so excited his friends were over that he was acting like a maniac the entire time, but he'll adjust. Maybe that was my key I don't invite people over nearly enough. One of Ethan's new Tot School classmates is Heather from And Then My Name Was Mama's son, Grayson, so I'm excited to have another blogger on the Tot School train! 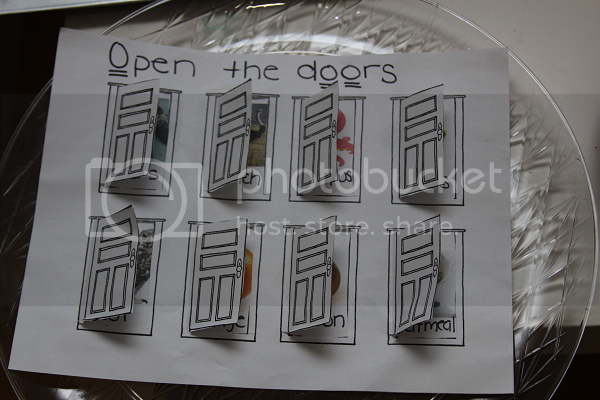 Instead of our magnet board, we did the new relevant "vocabulary words" via a door opening activity. Each time they opened the door, they'd find a picture and a word that started with O. 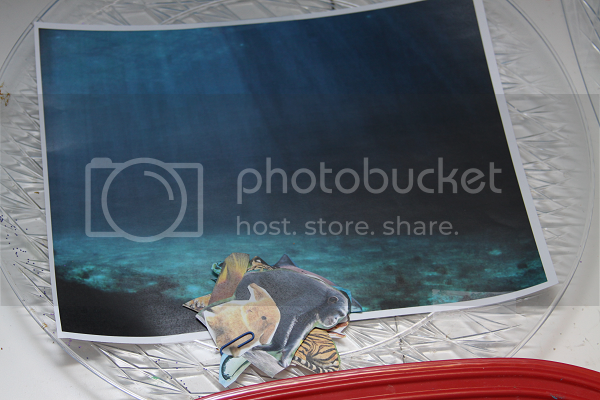 This one is an ocean scene with cut-outs of different animals. Some live in the ocean and some don't. The point of this one is to put the animals who live in the ocean in the ocean. 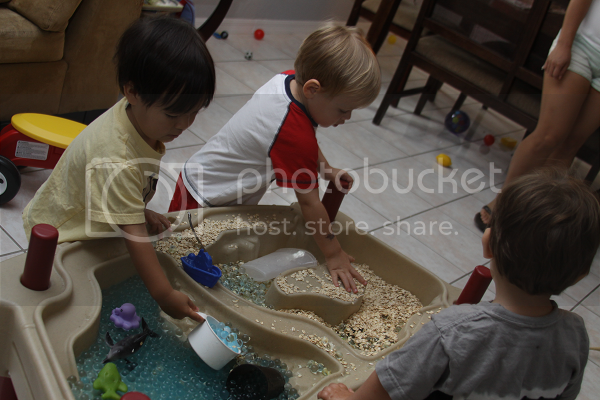 Ethan thought it was exceptionally funny to put the monkey, bunny and tiger in the ocean so they can swim with the other animals so, you know, as long as they had fun. 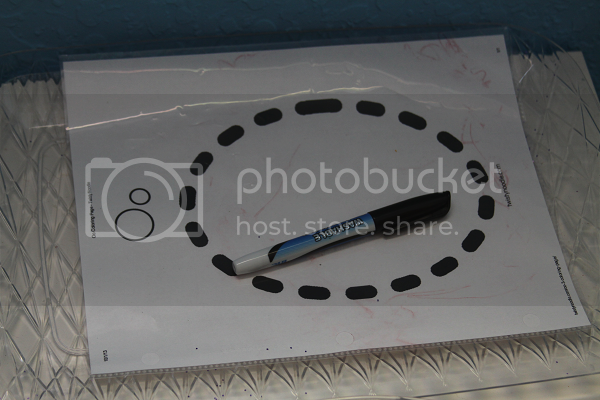 For some reason, the letter O tracing wasn't as popular as the tracing activities usually are. Ethan barely touched this one and I'm not sure anyone used it at all during our group class. 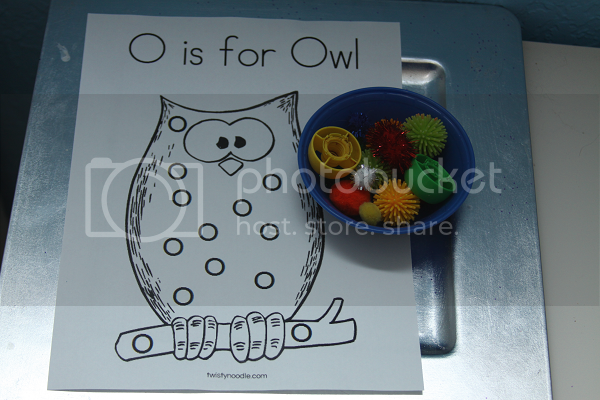 I took an owl printable from Twisty Noodle and added some letter O's to it at random. The point was to recognize the O's and put the little poms on them. This one was obviously kind of simple so everyone was bored of it a lot sooner than the others, but it was still surprisingly popular. Transferring is always popular in our house so I broke out some oats and created a quick transferring activity! This one was, by far, the biggest hit of the week! We started learning opposites so this tray showed big versus small. 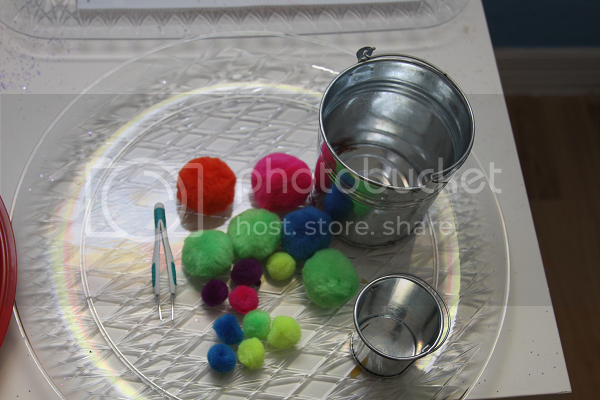 Using the tweezers, the point was to put the big poms in the big bucket and the tiny ones in the tiny bucket. 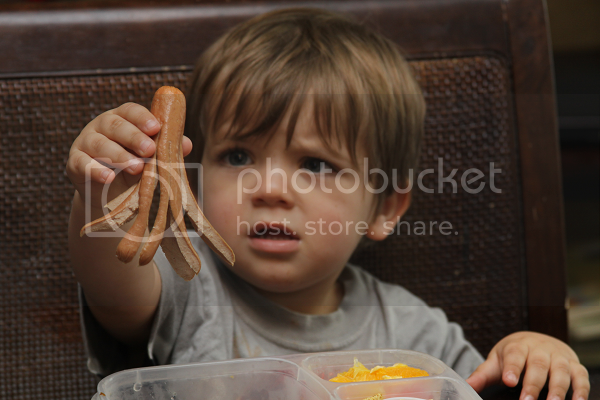 Ethan gets frustrated with the tweezers so he asked to use the tongs instead. 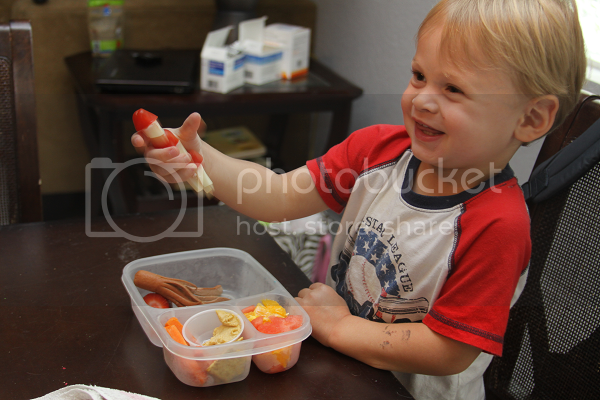 When I gave them to him, he pointed out that the tongs were big and the tweezers were little and said "uppa-dits" and it made my day, so this activity gets my seal of approval. 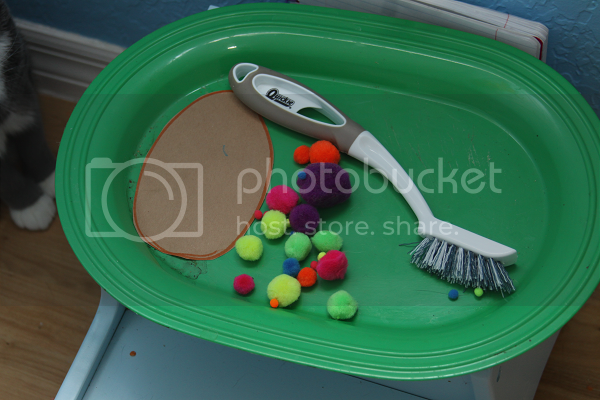 The point of this one was to sweep the poms into the letter O using a little grout brush (or "baby broom," if you ask Ethan). Ethan ignored this one at first but suddenly got really into it later on in the week. The group Tot School class went well, but my space is kind of cramped. Next week I will be taking a lesson from The Kavanaugh Report and eliminating the table altogether, using work mats instead. It will also be a nice way to space each child out so they're not on top of one another and wanting the tray that someone else has. 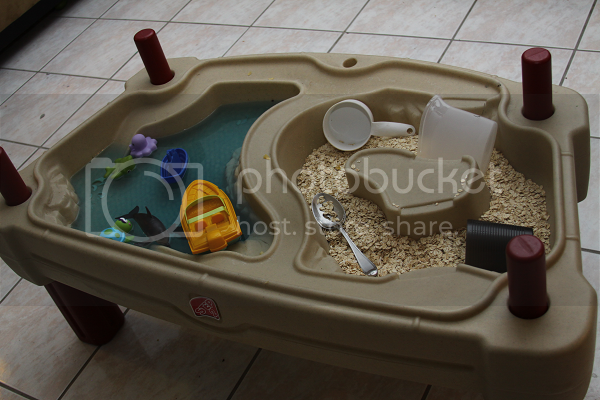 For our sensory activity for O week, I moved the water table back in my house and filled it with an ocean on one side and oats on the other. 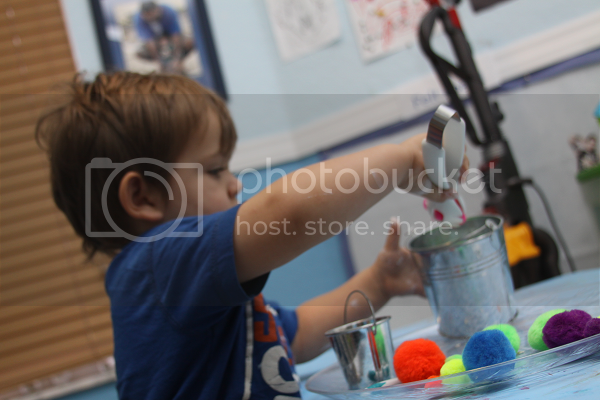 The ocean was just some blue washable marker dipped in water to add washable color with some water beads and ocean critters. All in all, I'm pretty excited about our weekly tot school class! They're great kids and get along so well together. I'm sure they'll fall into a routine eventually and we're still working out all of the details to make the transition easier. This is great! I feel like at our "tot school" they spend over half the time playing and just a little bit actually doing all the stuff we have planned, haha. Hopefully it will get better with time. We also just added a 3rd family (with 2 kids, one their age and one a year younger) so we'll see how that goes! I had no idea you were doing Tot School, too! So cool! I imagine it takes some time to get into the swing of things and they'll all get it eventually! My big problem is Ethan acting like a lunatic because he's so stoked his friends are over! Clipping art in the childhood was truly awesome. the children's are growing from the study point so Online learning courses is available for your children and also for all so keep check out your courses. thanks for sharing lovely post! Puzzling term basic verbalization Escorts Services in Delhi colossal upon the web display you particular here. You will find me managed to get concerns dependably. Spared! Great to have something fresh here on this article and i was taking a look on this information and then i have got many things from this article.It has to be a good thing to be here on this info.You did such a great job.